The Lumentek A19-FIL Series is a revolutionary achievement in the quest to replace the inefficient incandescent light bulb. Typical LED A19 light bulbs require heavy metal heat sinks that can make a table lamp top heavy or cause stress to a socket designed for a much lighter bulb. They also restrict the light and can cause shadows in many types of fixtures. Lumentek’s LED Filament series uses On Board Chip Technology that is able to dissipate the heat over a ceramic substrate. The result is a highly efficient lightweight LED light bulb that looks like and provides the same instant-on incandescent quality of light. 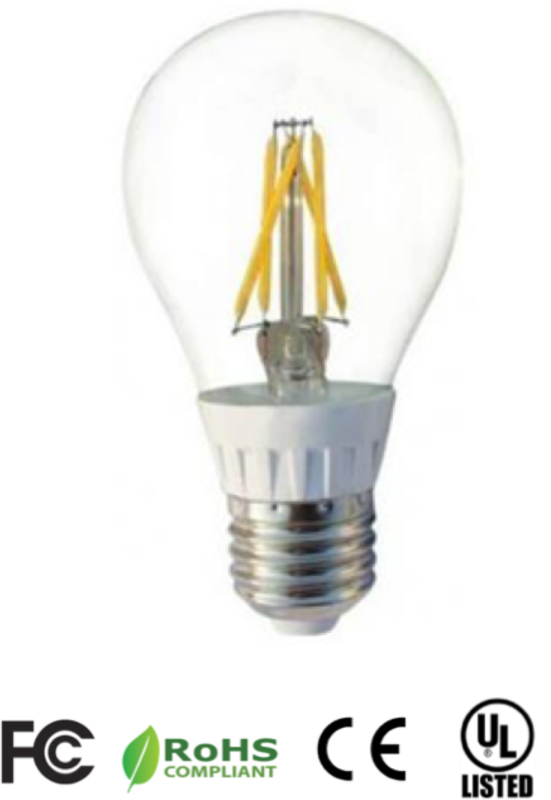 The A19-LED series is dimmable and available in Warm White (2700K-3000K). High Lumens Per Watt – Up to 110 lumens per watt. High Color Rendering – 80 CRI. Available in 4 watt or 6 watt versions.